I’ve always considered cheese making an art form. I was fortunate to grow up in Québec, a province brimming with artisans that makes cheeses that rival those made in France, both in quality and diversity. I grew up with parents who would serve and eat aged and fine cheeses on any and all occasions, and it has been my delicious pleasure to keep this tradition alive as an adult. Given my unabashed love for cheese, it can be surprising to learn that I only truly discovered Italian cheeses later in life. We did keep a couple of staples at home—shelf-stable parmesan cheese and brick-style stretchy mozzarella—but I was totally unaware of the unprocessed, authentic range of amazingly delicious cheeses made in Italy—until I actually visited Italy. I still remember my first bite of mozzarella di bufala, eaten on the terrace of an agriturismo in Tuscany, and the addictive nutty aroma of parmigiano reggiano floating in aging caves in Parma. Tasting these cheeses in their most authentic forms was truly life-changing for me, and I’ve been jumping at all opportunities to use (and eat!) Italian cheeses ever since. Most Italian cheeses require expert knowledge, specific ingredients, or even a precise geographic location to be made. But there is one variety of Italian cheese you can actually make at home—and quite easily at that: ricotta cheese. To be honest, before I started making it at home, ricotta cheese had been the one Italian cheese I wouldn’t totally get on board with. I liked using it in lasagna and in cheese tarts, but it wasn’t a cheese I would crave for. Considering I’m lactose-intolerant (quite the tragedy for a cheese lover), I really need to crave a cheese to indulge in. Making homemade ricotta cheese not only made me appreciate it more but also allowed me to make a lactose-free version of it (using lactose-free milk and cream). When you make homemade ricotta cheese, you have full control over the result: you choose the type of milk you want to use—Organic? Grass-fed? Lactose-free?—and you also choose how long you want your ricotta cheese to drain. 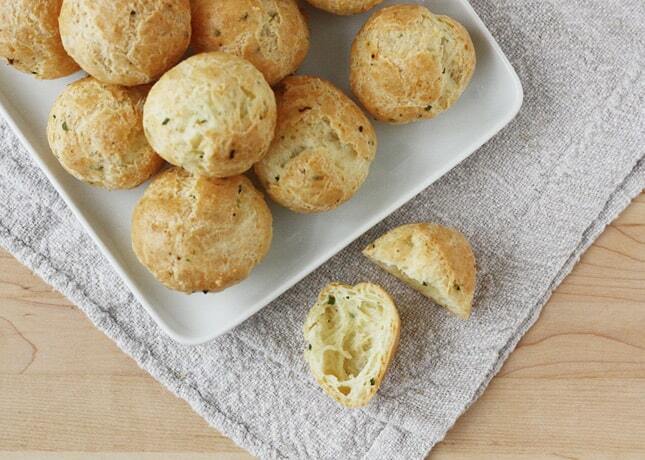 You can leave more water in it for a creamy, spreadable texture, or drain it further to use it in baked goods. Homemade ricotta cheese tastes rich and fresh, and it has a really lovely milky flavor. What’s more, making homemade ricotta cheese requires no knowledge of complicated techniques or equipment, requiring just a few basic ingredients to make (milk, buttermilk, cream, and salt), and it comes together in no time. And when I say no time, I mean it: if you have all the ingredients on hand, you’re basically 30 minutes away from your first batch of homemade ricotta cheese. I used to make ricotta using only whole milk, lemon juice, and salt. 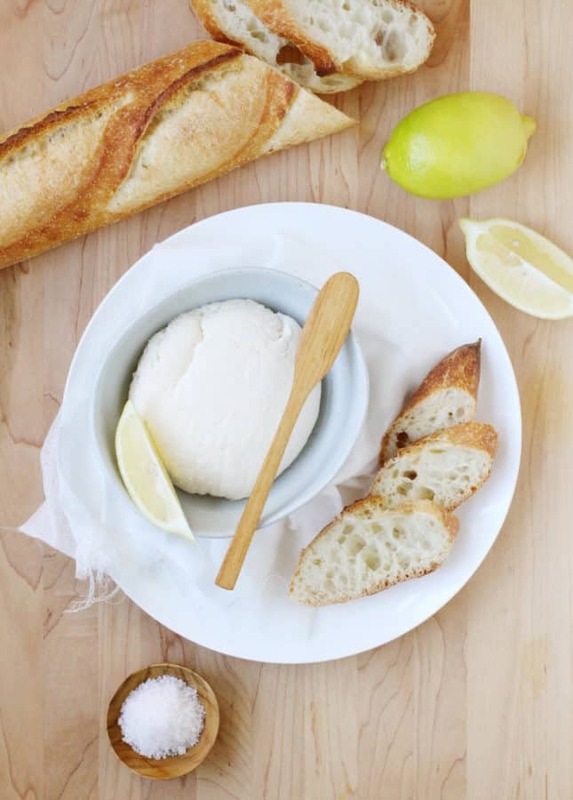 I always had these ingredients on hand, but it made for a slightly dryer, obviously skimmer ricotta, which I liked to use in recipes such as pasta and baked desserts. 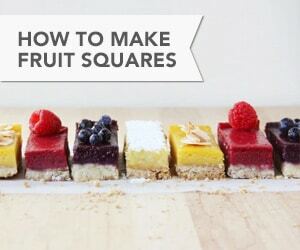 But recently, I stumbled on a new method while reading Aimée Wimbush-Bourque’s new cookbook, The Simple Bites Kitchen. In her homemade ricotta recipe, she uses reduced-fat milk (2% m.f. ), half-and-half cream (10% m.f. ), and buttercream. The genius idea is the use of buttercream, which replaces the acid that helps create the milky curds. Buttermilk is low-fat (it generally contains between 1 and 3% m.f.) yet adds a lovely richness to the ricotta. Aimée’s method helped me create the ricotta I’ve ever made: it’s unbelievably rich-tasting and creamy, yet has a moderate fat content, which means you can make and use it often without any guilt. I’ve made several batches of Aimée’s homemade ricotta cheese over the past few weeks and tested using it in many different ways: in a lasagna, in a tart, in pancakes, and simply spread over toasted baguette slices. I found it to be incredibly versatile and 100% better than any ricotta cheese I’ve ever bought. Maybe you never thought you’d be making cheese at home, but I challenge you to try making homemade ricotta cheese. I suspect you won’t ever want to go back to the industrially produced stuff. 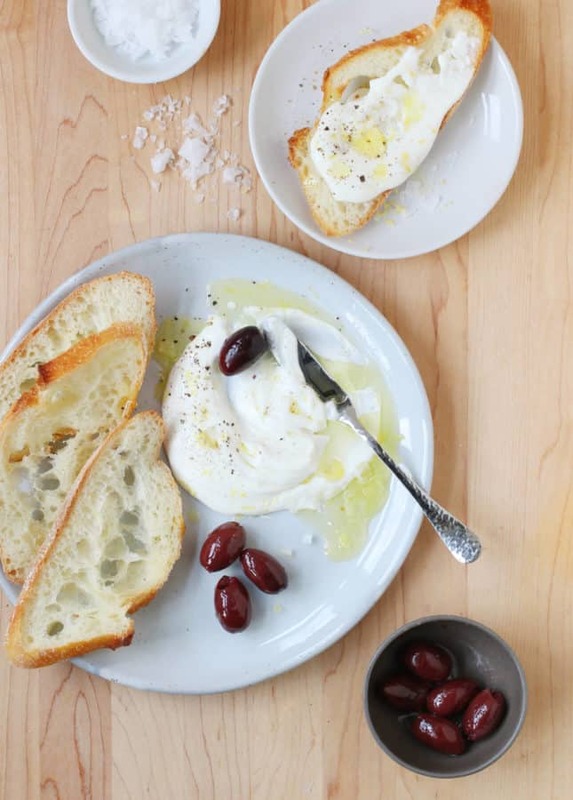 Below is a quick and delicious use for homemade ricotta cheese: Lemony Whipped Ricotta Cheese. Recipe follows the how to instructions! Using buttermilk: I’m pretty sure you’re thinking, “But I never have buttermilk in the fridge!” I don’t either… but I have it in the freezer! I need a 1/2 cup of buttermilk once in a while to make some of my favorite recipes, so I’ve taken the habit of freezing store-bought cultured buttermilk, so I always have it on hand. Simply store it in airtight containers in 1/2-cup or 1-cup quantities. It defrosts in the fridge overnight or at room temperature in about half an hour. Important note: When I’m out of buttermilk, I like to make “instant buttermilk” by mixing a tablespoon of lemon juice in a cup of milk and letting it rest for 5 to 10 minutes. This type of buttermilk won’t work for making ricotta. You need to use cultured buttermilk or use Aimée’s method to make your own 24-hour buttermilk (see recipe below for instructions). About the ricotta’s fat content: This recipe uses a cup of half-and-half cream (10% m.f. ), which enriches the texture and taste of the homemade ricotta cheese. If you prefer, you can make the recipe with 5 cups of whole milk (instead of 4) and forgo the cream. The ricotta will be leaner but still better than any store-bought light ricotta cheese. Monitoring the simmering process: Aimée suggests using a thermometer to monitor the milk if you have one. It’s a handy tool, but if you don’t have one, rest assured: you can still make ricotta. The trick is to keep a close eye on the milk mixture while it’s heating up right until you see it on the brink of breaking into a rolling boil. Small bubbles will vigorously be coming up all around the pot, and you should see the curds separating from the beige/pale yellow whey. Pull the pot off the heat and let it rest for 5 minutes before spooning out the curds. Draining the curds: You’ll need to line a large sieve or colander with cheesecloth and set it over a larger bowl. Cheesecloth is best for draining the cheese, but Serious Eats also vouches for simply using a double layer of paper towels (I’ve tried this and it works well enough.) 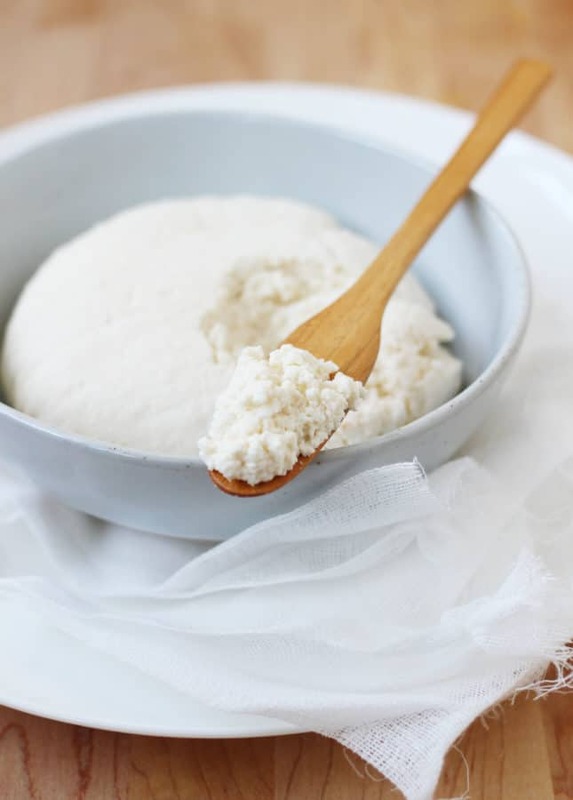 Once the curds are formed and ready, you should use a slotted spoon or a large spoon to gently collect as much of the curds as possible and transfer it to the prepared sieve. Let the curds drain as desired, then transfer to a glass jar or airtight container. You can then slowly pour the whey that remains straight through an unlined sieve to catch the remaining solids and save the liquid for another use. Some homemade ricotta cheese recipes (including Aimée’s) will advise you to drain the remaining whey through the lined sieve as well, but I find it clogs the cheesecloth or paper towels and thus takes forever to drain (if at all)—and this to collect very little remaining solids. You can catch those straight through the sieve and then be fairly certain all the good stuff is collected. 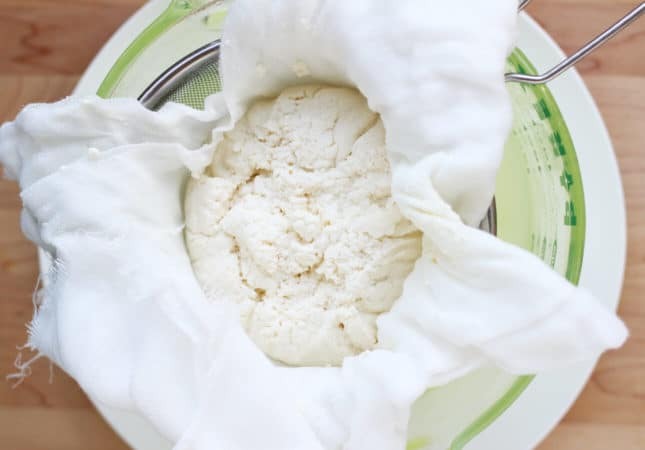 Storing ricotta cheese and whey: Homemade ricotta cheese will keep in an airtight container in the fridge for up to four days. You can also freeze ricotta for up to six months. Make sure to keep the whey: you can use it in smoothies, soups, or any recipe that requires milk. The whey will keep in an airtight container in the fridge for up to two weeks. Makes about 1 1/4 cups (300 ml). Learn how to make homemade ricotta cheese: it's easy and quick, requires no complicated techniques, and the result is better than any store-bought ricotta. Place a fine-mesh sieve or a colander over a large bowl and line it with two layers of cheesecloth or paper towels. If you have a thermometer, attach it to the side of a medium pot, making sure the tip of the thermometer doesn’t touch the bottom of the pot. Add the milk, buttermilk, cream, and salt. Place over medium-low heat and slowly bring to a simmer, gently stirring two or three times. This will take 10 to 15 minutes. 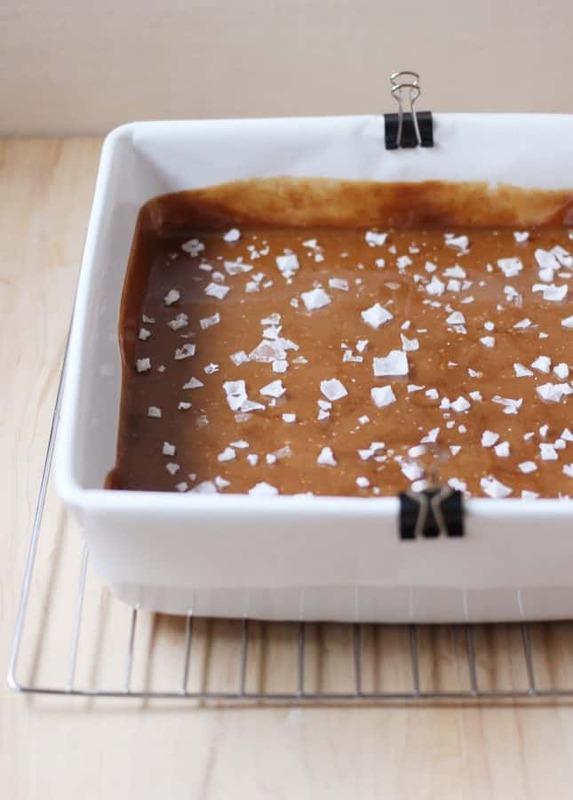 As the mixture heats, it will become grainy, and then the liquid will separate and small curds will begin to form (this will happen between 195° and 205°F/90° and 96°C). When you see cottage cheese-looking curds surrounded by cloudy beige/pale yellow whey, remove the pot from the heat and let stand for 5 minutes. Using a slotted spoon or a regular, large spoon, gently ladle all the curds into the prepared sieve. Let drain for 3 to 5 minutes for a milky-rich cheese, 20 minutes for a thicker, but still moist and spreadable consistency, or up to 2 hours for a dryer, crumbly texture (if you lined the sieve with paper towels, the draining process will take longer). Transfer the drained ricotta cheese to an airtight container or a glass jar. Remove the cheesecloth or paper towels from the sieve (you can rinse the cheesecloth and use it again to make your next ricotta batch), then slowly pour the remaining liquid through the sieve. Transfer solids (if any) to the ricotta container, then store the whey in a separate container. Use the ricotta right away (warm, freshly made ricotta cheese is dreamy!) or refrigerate the ricotta until needed. Homemade ricotta cheese will keep in an airtight container in the fridge for up to 4 days. You can also freeze ricotta for up to 6 months. Make sure to save the whey: you can use it in smoothies, soups, or in any recipe that requires milk. Store it in an airtight container in the fridge for up to two weeks. How to make 24-hour buttermilk: Fill a 1-quart jar (1 L) with hot water to warm it, then pour out the water. Combine 2 cups (500 ml) whole milk and 2 tbsp (30 ml) cultured buttermilk or sour cream in the jar and stir to combine. Cover the jar with a lid and place in a warm spot in your kitchen. Label the jar with the date and time. When the buttermilk is ready, it will have thickened slightly and have a tangy taste. This will take anywhere from 12 to 24 hours, depending on how warm your kitchen is. Refrigerate and use the buttermilk as needed. Place 1/2 cup (125 ml) ricotta in the bowl of a small food processor along with 1 tbsp (15 ml) heavy cream and 1 tbsp (15 ml) extra-virgin olive oil. Process until the mixture is super smooth. Alternatively, you can also beat the ricotta with the cream and olive oil using a whisk or a hand mixer. The whipped ricotta will retain a coarser texture but still be a delightful treat. Refrigerate for 1 hour. To serve, spread over a plate, then drizzle with extra-virgin olive oil, flaky sea salt, freshly ground black pepper, and finely grated lemon zest. Enjoy with toasted baguette slices. Recipe adapted from The Simple Bites Kitchen: Nourishing Whole Food Recipes for Every Day. Copyright © 2017 by Aimée Wimbush-Bourque. Published by Penguin, an imprint of Penguin Canada, a division of Penguin Random House Canada Limited. Reproduced by arrangement with the Publisher. All rights reserved. 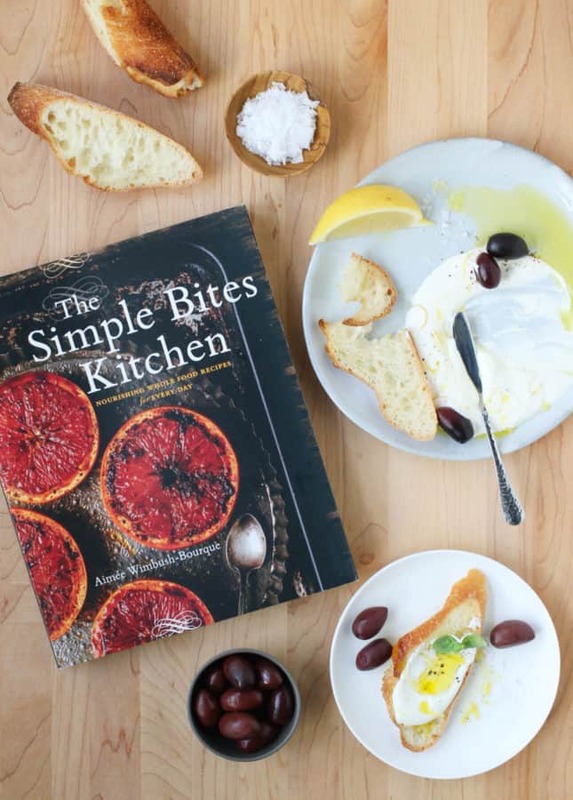 Win a Copy of The Simple Bites Kitchen! This post was inspired by Aimée Wimbush-Bourque’s latest cookbook, The Simple Bites Kitchen: Nourishing Whole Food Recipes for Every Day. It’s a beautiful book filled with delicious, doable recipes that promise to become your few family favorites, just like they’ve become mine. Optional: Take advantage of all the social media options in the Rafflecopter widget below to get more chances to win. When entering through social media, make sure I can recognize your name/address so I can reach you if you win. You must be a Canadian resident to win (or provide a Canadian mailing address). The giveaway ends Friday December 1, 2017, at midnight EST. I love to use ricotta to top toasted sourdough bread, and then sweet or savoury flavours to it. Like hazelnuts, dried blueberries, and local honey. Yum! I love ricotta and use it to moisten muffins and loaves! I love making ricotta cheese. Thank you for tips for lactose intolerant indulgers. My favourite way to use it is to add a variety of fresh soft herbs like basil, parsley and chives and spreading on crostini. Thank you for this opportunity and the great post on making ricotta cheese, Marie. This is one of my favorite foods! Great post Marie! I always include whipped ricotta with a drizzle of honey for my breakfast. Thanks for sharing the love of ricotta. Yum that sounds like a great way to start the day! Normally I use it in lasagna, but I saw a recipe for raspberry ricotta scones the other day that I’d love to try! Ohh I love the idea of using ricotta in scones! I’ll look this up. I like ricotta cheese in lasagna or a cheesecake! Just dreaming of some homemade cannoli over here! So excited to try this recipe! Yum! I’d love to tackle making homemade cannoli. Have you ever made them? I love ricotta in lasagna, but really should branch out! You should, ricotta is so versatile! I hardly ever use ricotta cheese! I like it though — in large pasta shells is yummy, or lasagne of course !! Ricotta and pasta are a classic match! I like using ricotta cheese in a classic cheesecake. I love to use it in lasagne or cannelloni recipes. These two classic, delicious dishes, are even batter when made with homemade ricotta cheese! I found a new recipe this summer and ricotta is the perfect for it! Peach slices, shredded chicken, peach preserves, green, and ricotta, all served on top of flat bread and broiled for a couple of minutes! In the summer months, I like ricotta cheese on baguette with some sliced heirloom tomatoes and sea salt. Great post! Ricotta goes into my lasagna too, but am going to try the whipped lemony ricotta – looks simple and tasty. It’s super easy and so good! 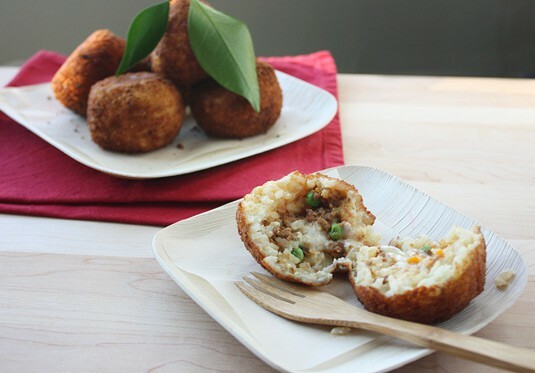 I plan on serving it over the holidays as an easy appetizer. As long as you have a batch of ricotta in the fridge, it literally comes together in minutes! Ohhh me too! You remind me I’ve been wanting to try making homemade cannoli for a long, long time. Now that I routinely make homemade ricotta, I think it’s time I give the dessert a try! Ricotta is one of those things that I feel most people think is impossible, or at least very difficult, to make at home. 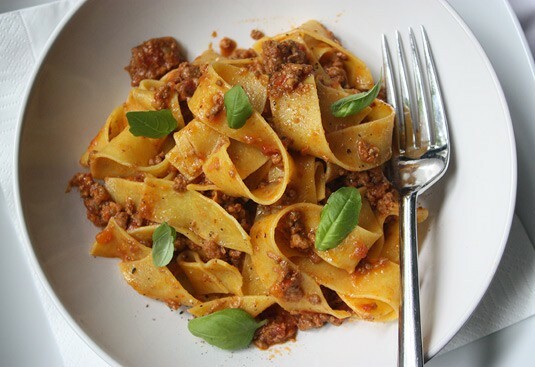 But Aimee’s recipe seems delicious and straightforward, perfect for home cooks. I love a good lasagna with ricotta, but I’m hoping to branch out too. love to use ricotta in lasagna! !